The following trip is best taken as an overnight trip (from Midland). 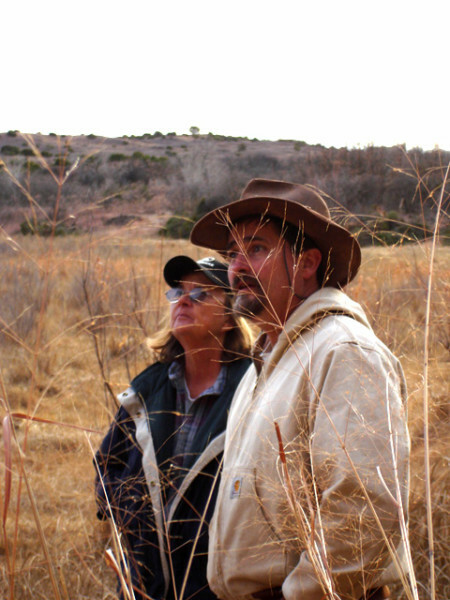 For additional details about this trip, read the accompanying essay. 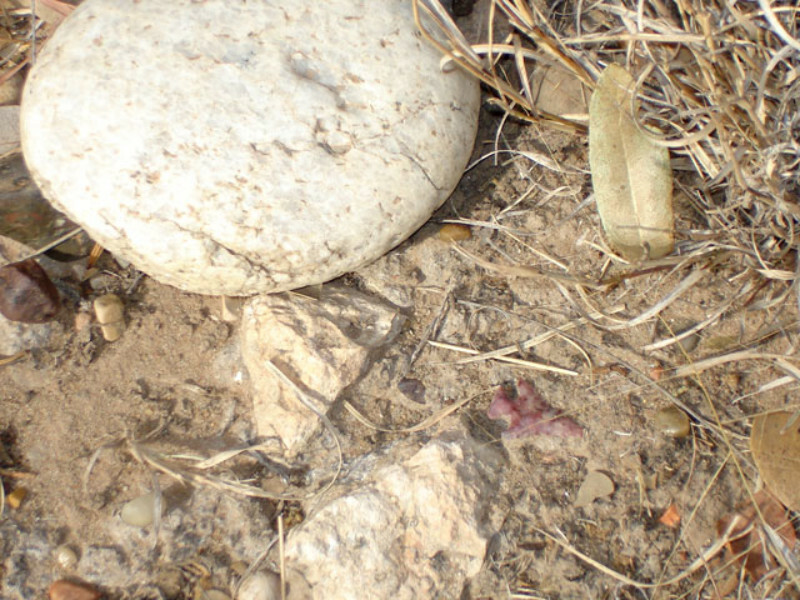 This petroglyph is the logo of the Mott Creek Ranch. 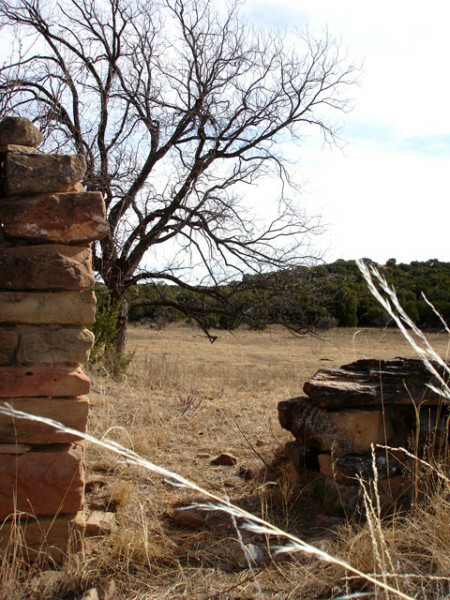 It could have been done by an Indian, or an early pastore, cowboy, soldier, or homesteader. It has long Spanish style stirrups, and the saddle has a high cantle. 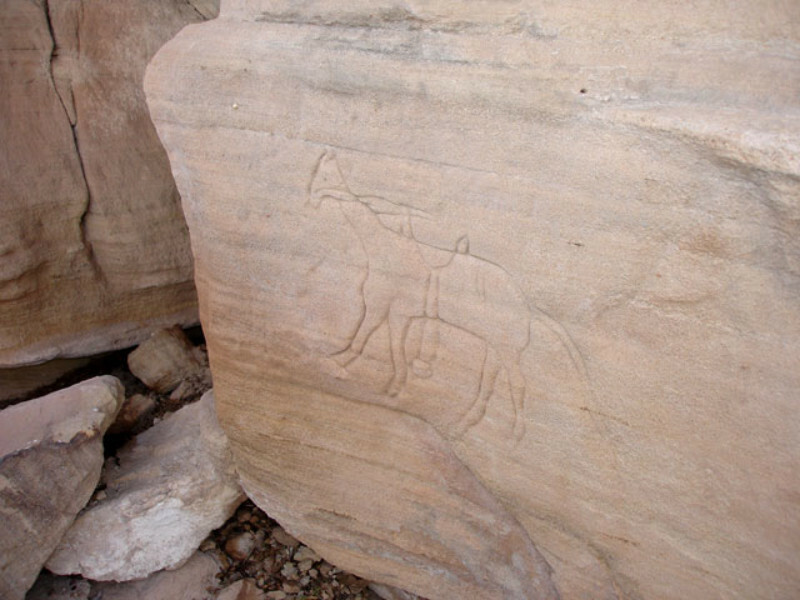 The brand is an U – but no ranch in the area had the brand, which means it could have been an image of an Army horse, but maybe the carver quit before adding the S.
This dripping spring is just below the petroglyph, hidden in a tiny and very short box canyon along Mott Creek. 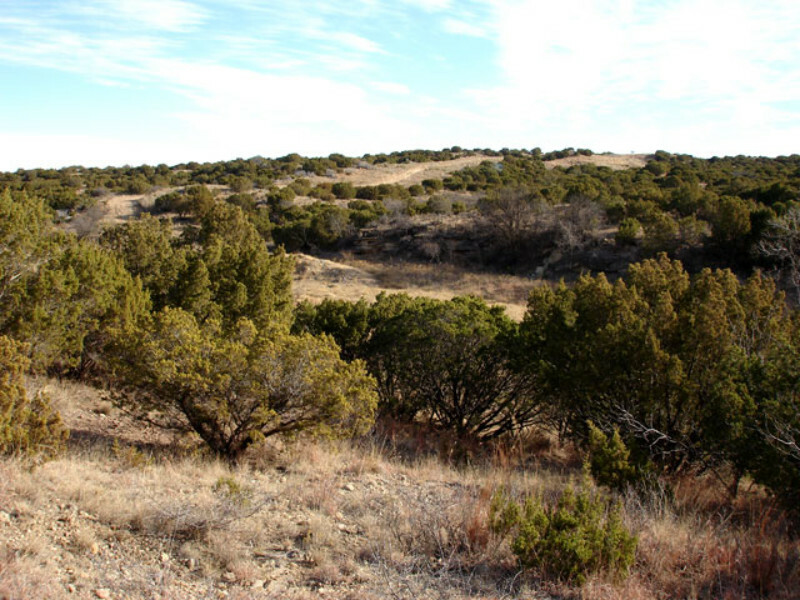 Juniper covers the hills of the breaks on the ranch. 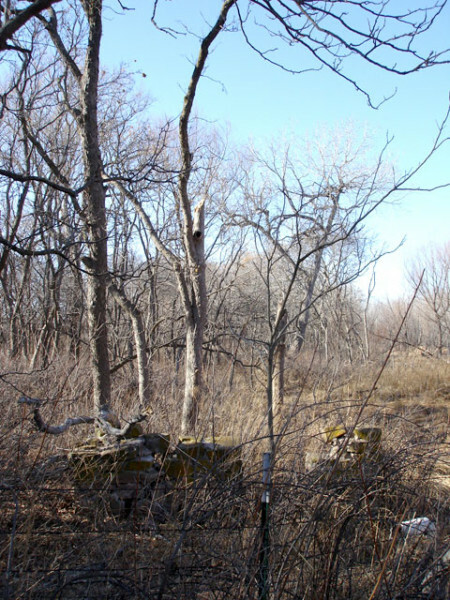 Along the waterways are other species of trees and shrubs. 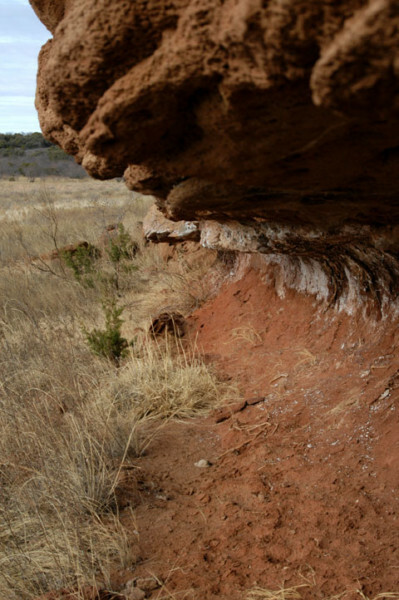 Part of the ranch has the classic breaks red Triassic sandstones with layers of gypsum. 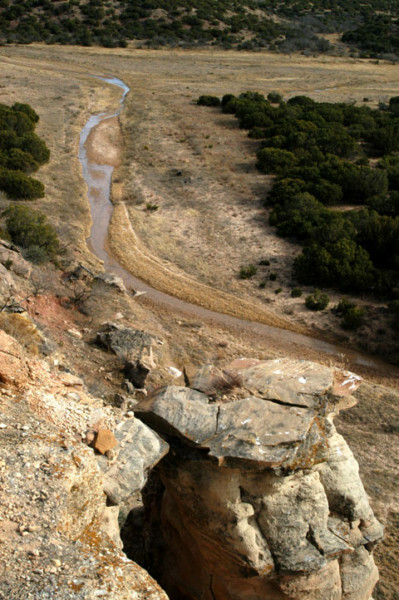 The confluence of Chimney Creek and Mott Creek, just downstream from Rattlesnake Rock. The 105 year old pecan tree in front of the dugout. 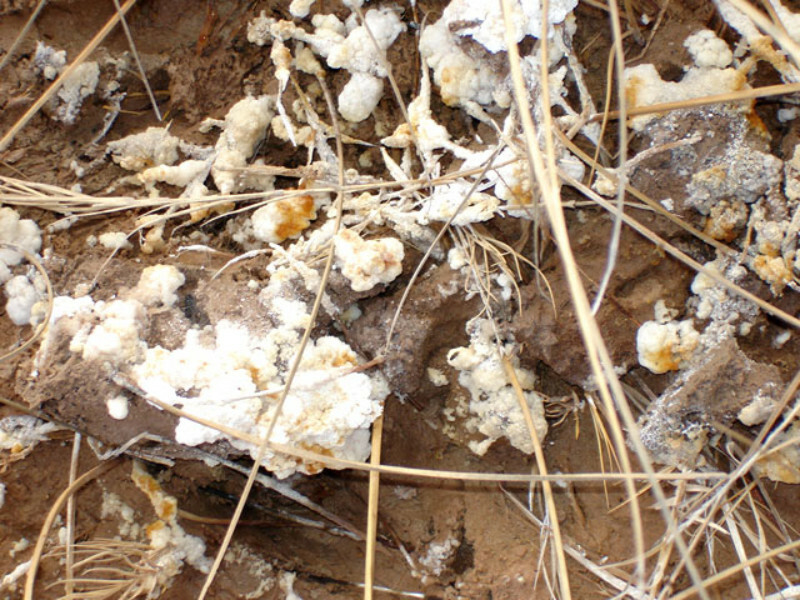 Salt efflorescence on the soil of the bottom of the canyon below the confluence of the two creeks. 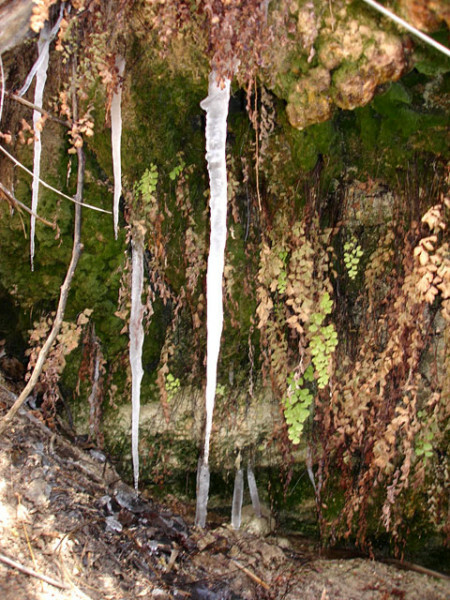 Even though the springs have good drinking water, it only takes a few miles for the creeks to have a high pH, as the water crosses the gypsum layers of the Triassic bedrock. 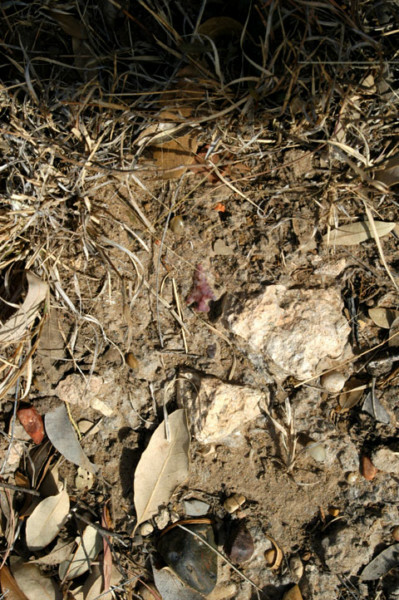 A mano was found not far away and placed next to the Scallorn point. 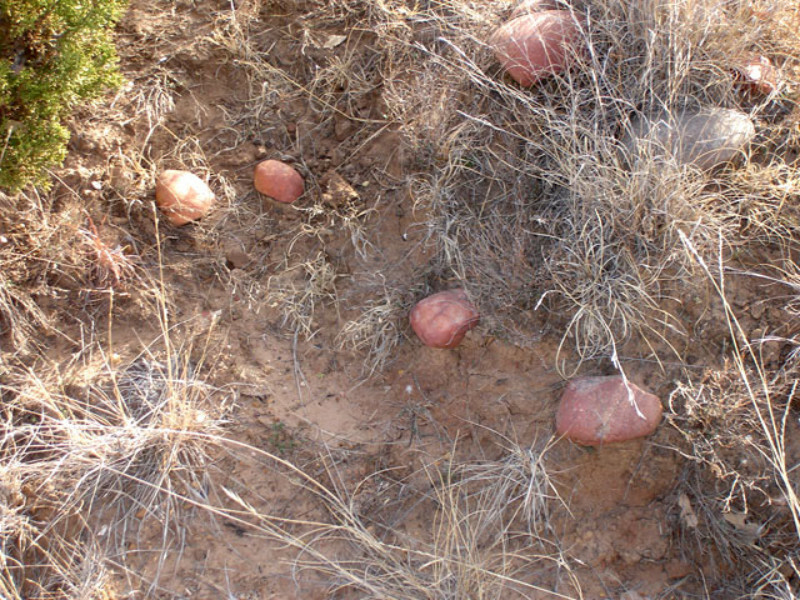 When these round stones were hot from a fire, they were dropped into water tight baskets to cook stew. 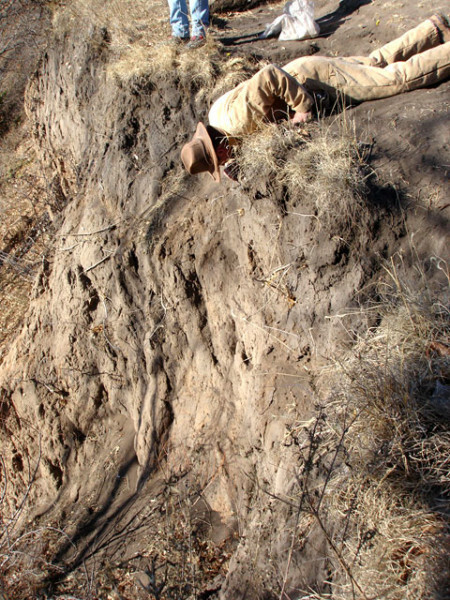 Rick Day is leaning over the edge of the bluff at the buffalo kill site to remove an artifact before the bluff erodes and the artifact slides downward 40 feet. 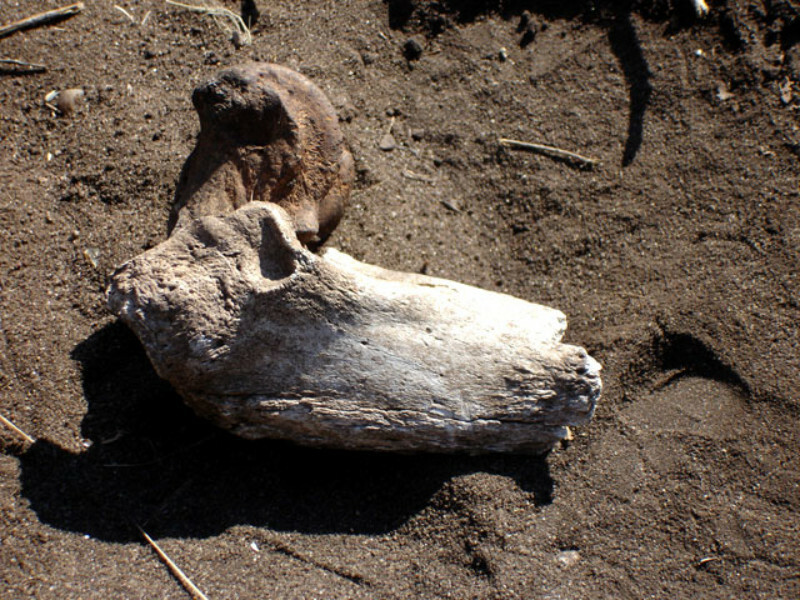 What Rick pulled out of the bluff, two bones that make up the ankle of a buffalo. It had been in place for at least 650 years. 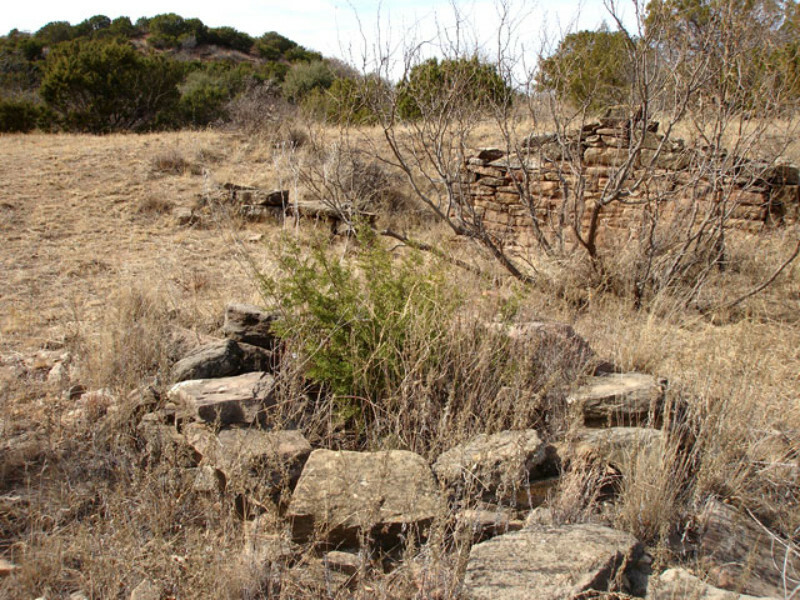 The remains of the old springhouse built in the late 1800s, when the Mott Creek Ranch was a line camp of the famous Matador Ranch. 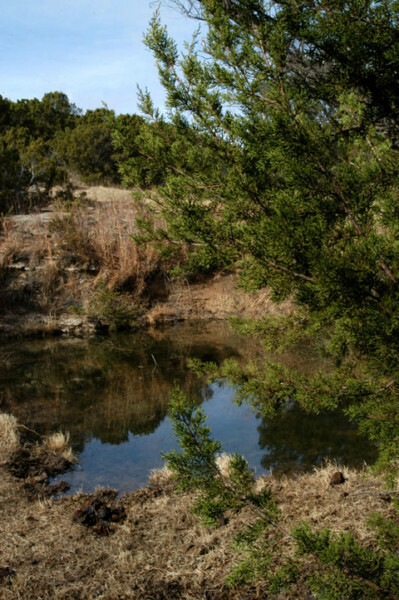 It is down in a wonderful cottonwood and willow bosque near the springs of the creek. 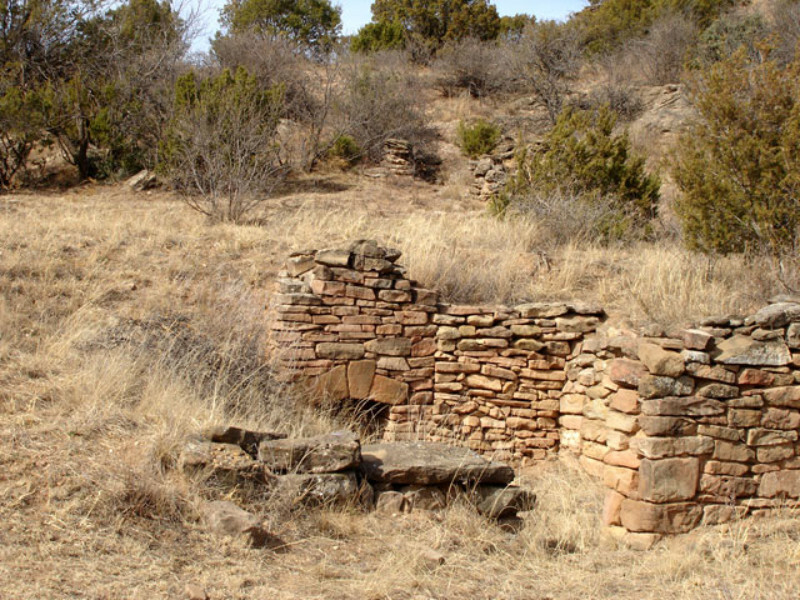 Milk, meat, and other perishables would have been kept in the springhouse. 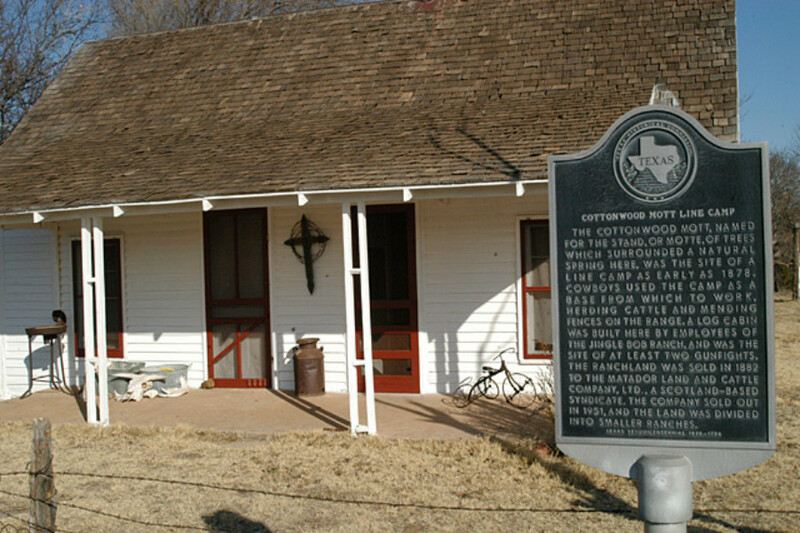 Historical marker in front of the old line camp house. 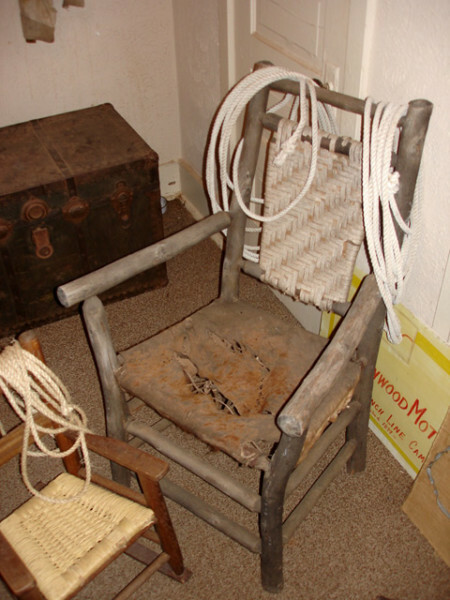 100+ years old homemade chair from another of the old Matador Ranch camps. Rick Day and Marisue Potts.